Overall fishing has been fair to good, this past week we have been fishing the Gulf Islands for Salmon, Pitt River for sea- trout and the Fraser for Sturgeon. All 3 fisheries have been producing fish so it’s just a matter of predicting weather and water conditions. The Fraser has been fishing fairly well considering the water is high, rising and lots of debris coming down. Yesterday we landed over 20 fish between 2 boats, several fish over 5 feet, lots of smaller fish in the 3-4 foot range. Water is expected to rise again over the next few days but there is lots of fishable water if you know where to go. 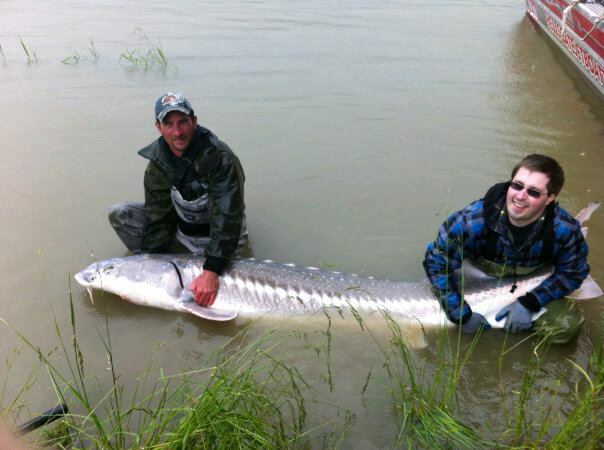 This fish measured 6ft 5 inches caught on Saturday near Mission. Although the water is high there is some good fishing to be had if you have good bait and local knowledge. Some days are a bit slower than others but overall we are averaging 5 to 10 fish per trip. Best bait has been Eulichons and lamprey eel. 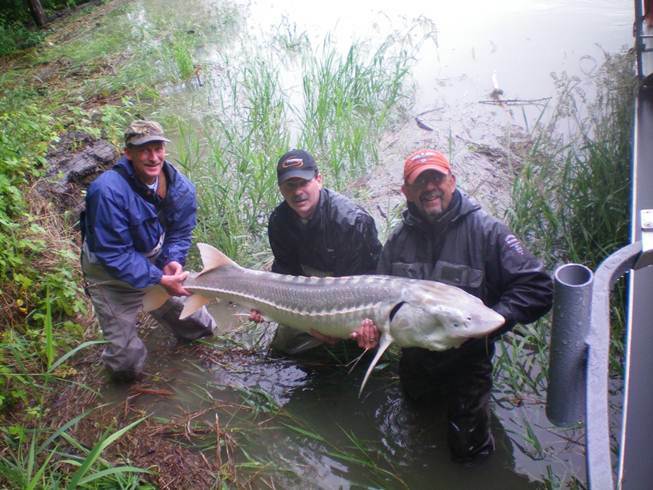 Here is one over 7ft landed this week by Greg Anderson of Fort Mac, Alberta. 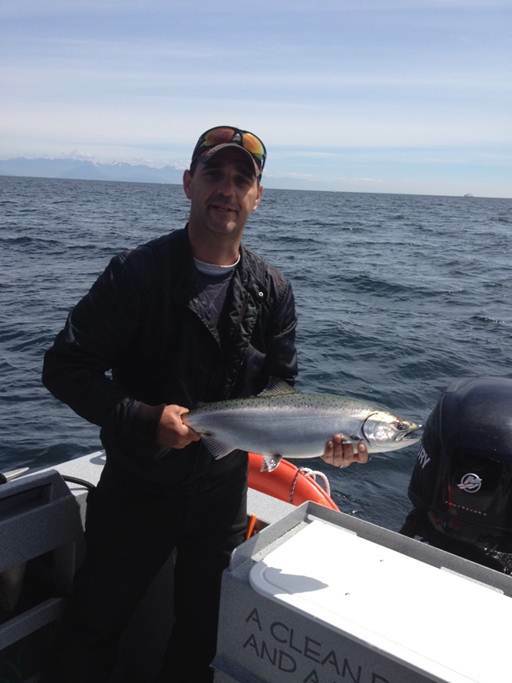 Vancouver Fishing has been fair to good, most of our trips have been over to the Gulf Islands. Weather has been story of the week, winds and rains have made travel a bit uncomfortable but for the most part we have been able to finish all trips. On Saturday we pulled the plug as Gale force winds were expected for the strait. Small Chinook Salmon caught this week while fishing the Gulf. 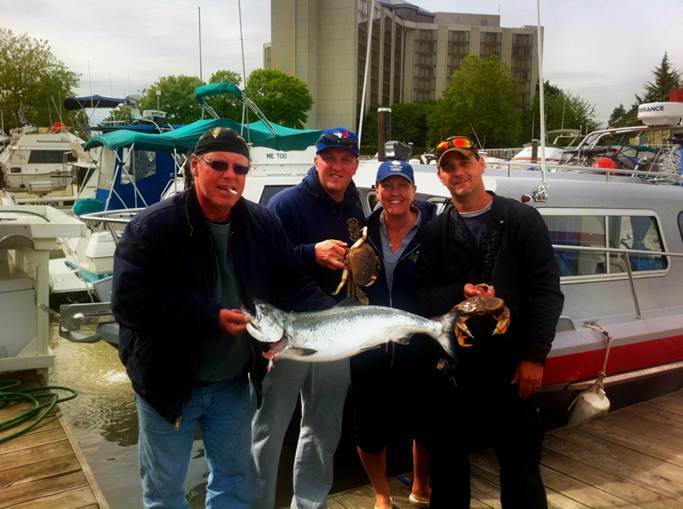 Some nice Chinook were caught this week, nothing over 20 lbs but some nice teenagers. Trolling with flashers / spoons & hoochies at 60 to 130 feet seems to be the trick. Thrasher Rock, Entrance Island and 3 miles off Gabriola Island in 600 to 1000 ft all produced fish. 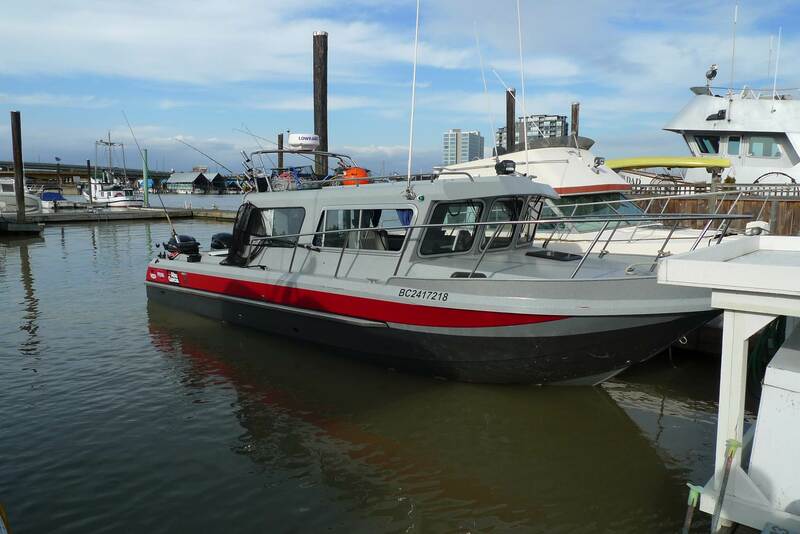 Come join us for a Vancouver or Gulf Island Fishing trip, our saltwater boats are moored at the Delta Airport Hotel. 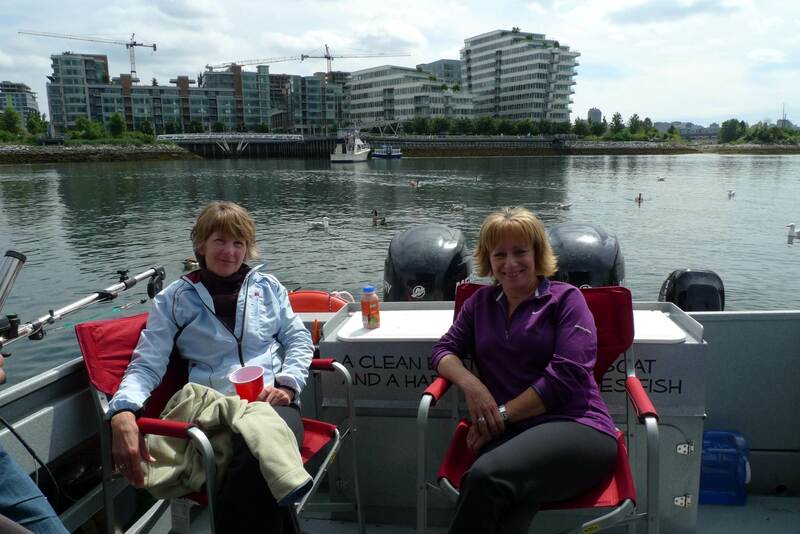 We spent several days fishing the Pitt River, fishing has been okay but nothing to get too excited about yet. Water came up high yesterday but should drop back down in the next day or two. Some nice fish being caught on both fly and spoons. Best to book a weekday charter as weekends are getting a bit crazy up there. 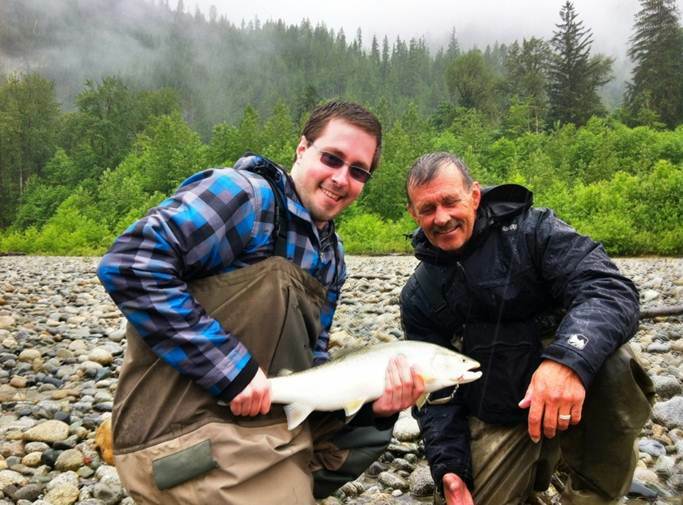 A bit wet but Greg and his son enjoyed a peaceful day on the Pitt this week. Only landed two fish but this one was well over 5 lbs. Over the next few weeks we will be fishing the same three fisheries and a couple more we prefer not to talk about. If you’re looking for a charter in the Vancouver or Fraser Valley area, STS has the team of guides that can find you the fish. Our team are the hardest working guides on the water, let us show you why STS is the leader in the industry.